3' cable costs $32.55. These cables will come in Black/Red or Gray/Red depending on what is in stock at the time. Click on drop down menus below to choose lengths and other options. This cable feature the Canare F-10 Gold Plated RCA's, with cable strain relief. 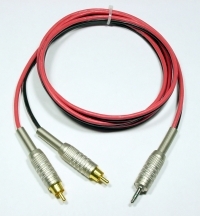 For functionality or to lower the cost you can substitute the Calrad RCA's on the dual end. Excellent for getting your MP3 Player into your system or for recorders. Again, these cables sound better, work harder and last longer than the junk sold at the big stores.